I love apple pie. The tart apples, the hint of cinnamon and nutmeg, the sweet juices that come out when you cut a slice . . . is there a more homey dessert? I'm also a big fan of repurposing leftover ingredients and finding healthier ways to enjoy my favorite food flavors. 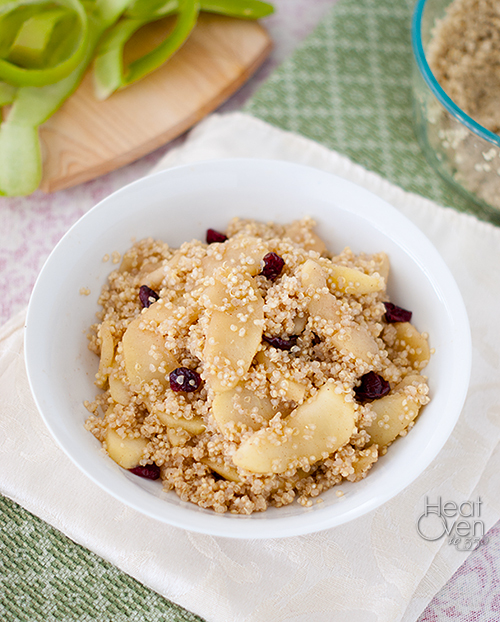 That's where this apple pie quinoa salad comes in. It uses leftover quinoa. It has the same cinnamon goodness, the same deliciously sweet-tart juices and the best part? It is fast and easy. You can enjoy apple pie flavor in less than ten minutes. I originally made up this salad as a snack for my daughter and put it together during a nap time one day. After sampling a few (maybe more than just a few) bites I decided I should really also see how it tasted cold (in the name of research) and put the rest in the fridge. After discovering that it tasted great cold, I thought I should really see how good it tasted the next day. And after learning that it tasted great the next day, there wasn't much left so I just polished that whole thing off. My daughter had to wait until the next batch (which I doubled) to finally try it. Sometimes being the mom has its perks. Whether you want to share it or not, this is a great fruit salad with apple pie flavor and a healthy amount of protein and vitamins to boot. We are big quinoa fans at our house so this is perfect for us, but if you like another grain or have something different leftover you could sub it in for the quinoa. Peel and core apples and cut into thin slices. Place in a microwave safe bowl and toss with the sugar, cinnamon, nutmeg and ginger. Microwave apple mixture for two minutes, stir and microwave an additional 2-4 minutes or until apples are starting to soften and release juices. Pour off juices into a bowl or mug and reserve. 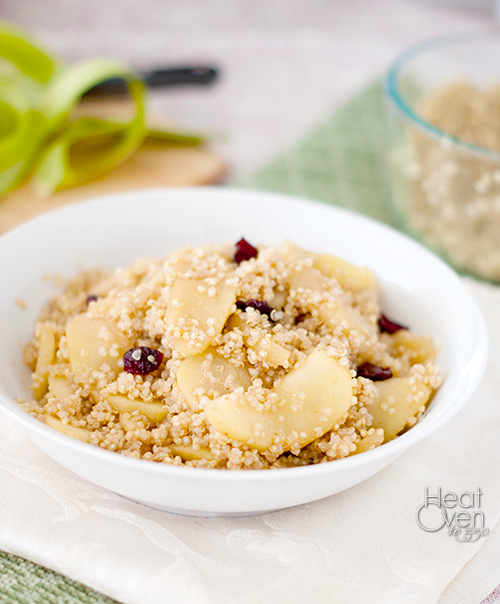 Stir in quinoa and cranberries and add juices back until the salad is desired sweetness and consistency. Add lemon juice if desired and serve.